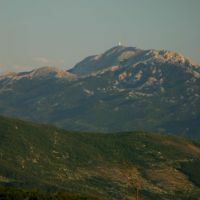 Imotski county is placed behind Biokovo mountain just where Bosnia, Herzegovina and Dalmatia meet, so it is no wonder that the county was constantly changing boundaries and rulers. The current boundaries were determined during Požarevac peace treaty in 1718 when the Imotski valley was split into two parts, one belonging to Dalmatia i.e. Venetians at that time and the other to Turks who were the rulers of Bosnia and Herzegovina. The relief was mostly formed in Eocene and Neocene periods, the northern strip from Studenci to Imotski and all the way to the Herzegovina boundary in the former and the Biokovo region in the latter period. The relief got its shape at the end of the Neocene period after the movements of the Earth crust caused by wrinkling and crevices movements. The most important crevice is on the northeast side which seems to be still active. The young stones were removed by the rivers in the valley while the collapsing of underground caves gave rise to Imotski lakes. Imotski valley is situated in between Podi plato, 600-700 meters high on the north side and Osoje ravine on the southern side. It is 33.3 km long running from northwest toward southeast. 17.5 km of it belongs to Imotski county. The valley is widest between Runović and Vinjani, 5 km and the narrowest between Kamen Most and Glavina, 1 km. The Dalmatian part of the valley is 45 km² area that consists of Upper and Lower valleys. The Upper valley, 22,5 km², has Proložac field, Proložac retention with Krenice, Proložac, and Provalija lakes, Naklo, Lug, and Mujića fields, and Brižine. The Lower valley consists of Pasike, Dila, Krenice, Ljupčevica, Vinjani field, Otok, Zalug, and Zmijavci and Runovići fields. The Imotski county has 23,5 km² of the Lower valley while Herzegovina has 50 km². Herzegovina part of the valley is called Bekija. There are many ravines, platoes, and hills south of the valley: Mračaj (534m), Podosoje (842), Vardište (693), Osoje (868), Vilinjak (859), Orljaca (909), Sidoc (849), Sridnja gora (556) and of course mountain Biokovo (1762). On the north side are platoes Podi (680) and Vinjani (717). In addition to Imotski valley there are two other fields: Studenci and Aržano fields. Studenci field is rather small, 1 km² in area, 3 km long and 0.4 km wide. It is divided in two parts: Large (Veliko) and Small (Malo) fields. Aržano field is also very small with the area of 1.4 km². 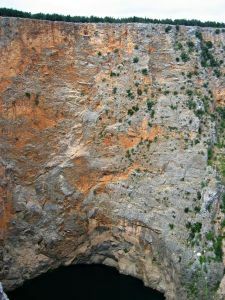 There are many caves and sinkholes in the county, most of them unexplored and located near Biokovo mountain. Well known ones are Jovna near Krstatice, Gradinice, Lozovac, and Ljubovička near Ljubović in Biokovo. Explored sinkholes are Golubnjača (15 m deep), Ivanić (50-100), and Procipska which depth has not been measured yet near Krstatice, and Gozdenjača on the boundary of Slivno and Krstatice. Unexplored sinkholes are Golubinka near Osoje, Vitrenjača, Čavčanjača, i Brsčanova on the boundary of Slivno and Krstatice, Mijoravača in Župa, and Vodena and Ćapinova in upper Podbablje. The terrain is tectonically very unstable, placing the Imotski town region in VIII earthquake zone under Mercalli scale. There were several major earthquakes in years 1923, 1937, and in 1942. The climate is influenced by Mediterranean climate in the summer and by the continental mountains climate during the rest of the year. The summers are very dry and warm, while the winters bring very little snow. The sky is mostly bright during a year with more than 230 sunny days. Rainy season is mostly in November and February producing 1300 mm of rain per year. The most important winds are the cold northern wind called "bura" with sometimes very strong gusts of more that 70 miles per hour and east-southern wind called "jugo" that brings humidity and rain from the Adriatic sea. The tree vegetation is mostly deciduous: linden, acacia, white poplar, elm. Dalmatian pine is a predominant coniferous tree in the county. There are also firs on Biokovo. The Imotski County water masses belong to Vrljika Imotski drainage system that is one of the thirty-four Croatianrainage regions. It consists of Imotski valley and a few smaller karst fields, 602 km2 in total. The eastern side of the Imotski Valley, called Bekija belongs to Bosnia and Herzegovina. The main river Vrljika is 18,286 meters long, with 12,714 meters belonging to Croatia. Its main wells are Opačac and Utopisće, which are never dry. The seasonal ones are Jezerine, Duboka draga, Jauk, Jažva, and Dragonja that depend on the snow melted on Bosnia mountains. Vrljika, it is also called Matica east of Kamen Most goes underground and changes its name three times. 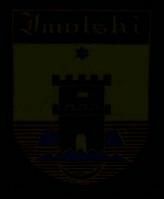 First, it changes name to Tihaljina, then Mlada, and last to Trebižat that merges to river Neretva. This four (five) times name-changing river is more than 68 km long. Most of the Imotski streams, lakes, and many canals contribute water to Vrljika. Another important water resource for the Imotski-Bekija Valley is Ričice dam accumulation that receives water from river Ričina and stream Vrbice. Its dam is 45 m high. It was built to prevent floods in the wintertime. The flow thru the dam used to be 1000 liter/s before the construction of the Tribištovo and Rastovača accumulation in Bosnia and Herzegovina, when it fell to 300 liter/s. Stream Suvaja takes Ričice dam accumulation water to Prološko Blato (a retention), on the left, that can accumulate up to 11.4 mil m3 of water mass. The Prološko blato water supplies water to the western part of Imotski-Bekija Valley via canal Sija. It has levies 1,147 meters long on the east side with a regulated vent. Low water level exposes Krenice, Provalija, and Jezerce lakes, reducing Prološko Blato to Prološko Lake. In addition to Suvaja, Prološko Blato gets water from nearby Galipovac, Knezović, and Mamić lakes. 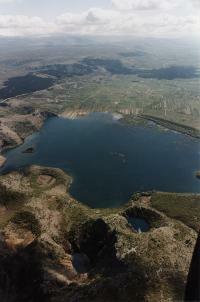 They are typical karst lakes. 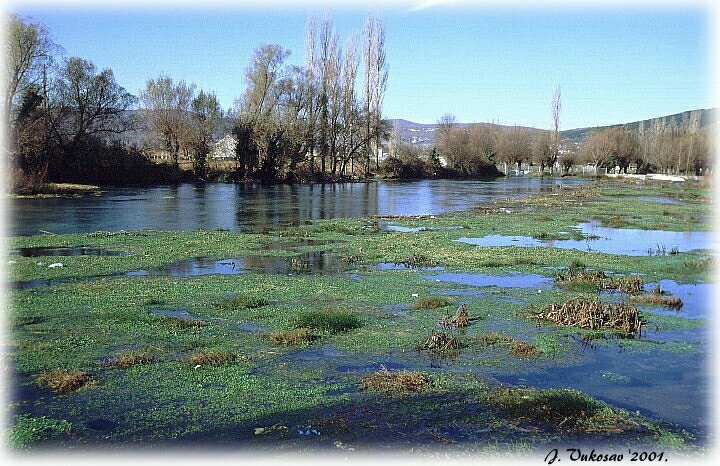 Further east there is Jezerine or Dva Oka (Two Eyes) as they are better known that are seasonal springs for Vrljika river. The north "eye" is 42 meters in diameter, while the south "eye" is 44 meters. The depth of the north "eye" reaches 12.7 meters. Near village Glavina there is seasonal Jažva lake which is dry in summer time. Modro and Crveno or Red lakes are the most well known and attractive lakes. Both of these lakes were created by water erosion of the underground channels and caves. The earthquakes have further contributed to the current shapes, even though the region is not tectonically active. Modro Jezero has a shape like a kidney. It is 800 meters long and 250-400 meters wide. It gets dry in the early Fall in some years. The maximal water level is 107 meters, when it starts overflowing on the south side. That is exactly what happened in year 1914. Red Lake is one of the deepest karst lakes in the world. Its north side is 250 meter high, with 280 meters of water below. The precise depth of the lake is not known due to its complex connected water reservoirs. There were several expeditions in the recent years making lots of progress, but not providing the definite answer. The bottom of the lake is just 4 meters above the sea level.